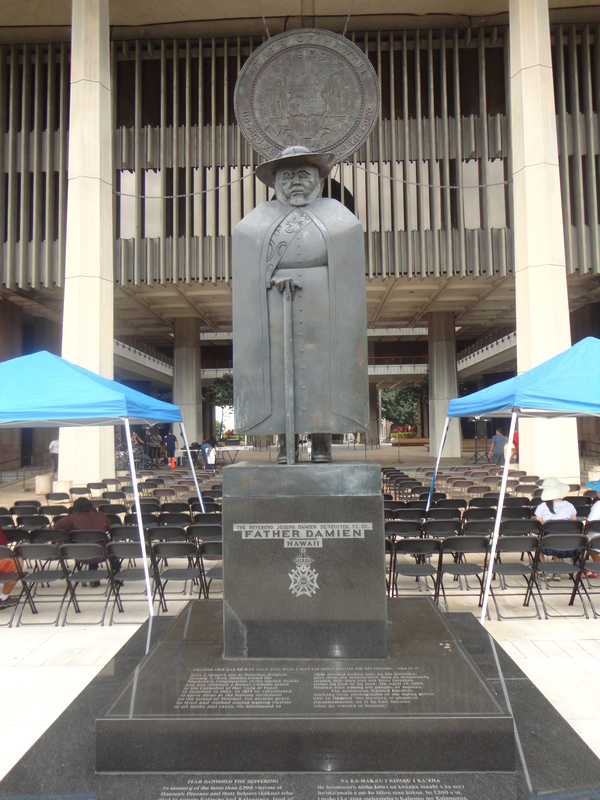 I had heard the name Father Damien in the past, but it wasn’t until we visited the Royal Palace and stopped to see the unusual construction of the State Capitol in Honolulu that we spied the modernistic sculpture of Father Damien by New York sculptor Marisol Escobar. This Catholic Priest is famous for his work on the island of Molokai at the Leper (Hansen’s disease) settlement at Kalawao and Kalaupapa where he voluntarily served the unfortunate Hawaiians that were rounded up and shipped to the island to live out the rest of their lives. We took a helicopter ride and our pilot pointed out an area off Maui where the sick suffering from Leprosy was left to swim with their belongings to the island. It took the love and devotion of the Belgium priest born in 1840 to bring this disease to national attention. At this point in history, Leprosy was thought to be an incurable disease. It is in fact, an infectious disease that causes severe, disfiguring skin sores and nerve damage in the arms and legs. According to Web MD, Leprosy can only be contagious if you come into close and repeated contact with nose and mouth droplets from someone with untreated leprosy. Today the disease is curable and the World Health Organization provides free treatment for all people with leprosy. Through his efforts he was able to raise money and resources from the church and the Hawaiian Government. His efforts brought worldwide attention to the levity of the leper colonies and the suffering of his parish. Because he did not refrain from personal contact with the sick, after being on Kalawao for 12 years it was confirmed that he had contracted Hansen’s disease. He was 49 years old when he died April 15, 1889 with the Catholic nun Mother Marianne at his bedside. We didn’t make it to the island of Molokai, but this story stuck with me and makes me want to find a copy of the 1999 movie about his life. Father Damien has since been canonized as a Saint in the Catholic Church.